Where do you start with a book festival that has 450 authors, panelists and performers? I kicked off Saturday morning with a children's author, Jon Scieszka. If you don't know him as an author, you've missed some of the funniest books, beginning with one I love, and have used successfully with adults, The True Story of the Three Little Pigs. Of course, he became a smash hit with boys with his book, The Stinky Cheese Man. And, this author who works so hard to write books that boys would read, was named the first National Ambassador for Young People's Literature by the Children's Book council and the Library of Congress. His presentation on Saturday was Guys Read: Inspiring Boys as Readers. Scieszka addressed an audience of kids and adults, all fans, and began by telling us he gets lots of questions from crazy people. He said his favorite question, though, came when he addressed a group of school children and talked to them for almost forty minutes about writing. He said he made the mistake of taking a question from a little girl in the front row, usually the first graders or kindergartners. It was, "Do you have a real job?" As much as I'd like to repeat Scieszka's entire program, there isn't time or room. So, I'll just say his interest in boys and reading came about because he was the second of six boys who grew up in Flint, Michigan, sons of a principal and a nurse. That childhood, wrestling with his brothers, is related in an autobiography, Knucklehead, that VOYA said, "reads more like a conversation with the class clown in the back row of Algebra I than a memoir." And, Scieszka's presentation was just as lively, and just as much fun, as that conversation. A perfect way to kick off the Tucson Festival of Books. Other Crimes featured mystery authors. Right to left in the picture are Libby Fischer Hellman, Cara Black, Shilpa Agarwal, and Suzanne Arruda. Each author told a little about themselves. Libby said she's the "best author you've never heard of," and proceeded to introduce the audience to her two series characters, Ellie Foreman and Georgia Davis. The books are set in Chicago, but Doubleback, the latest book, brings both characters together in a novel that goes from Chicago to Wisconsin, and ends in a border town in Arizona. Libby and Cara Black have both appeared at the Velma Teague Library in the last year. Cara was just there last week, discussing her latest Aimée Leduc investigation, Murder in the Palais Royal. That book brings Aimée repercussions of her first case in Paris, Murder in the Marais. Cara turned the mike over to Shilpa Agarwal, whose debut mystery is Haunting Bombay. That novel is set in India in the 1960s, and it tells the story of the drowning of the baby of a wealthy family in Bombay. Subsequently, the grandmother adopts another baby, Pinky. At age thirteen, Pinky opens a door in the family bungalo, and finds the ghost of the dead child in the room. Agarwal was born in Bombay, but grew up in Pittsburgh. She would spend summers in Bombay with her extended family, and she asked her parents to tell her about the family. That drowned child is part of Agarwal's family history. Treasure of the Golden Cheetah, Jade is leading a group of silent movie actors on a safari up Mount Kilimanjaro in Kenya. But the producer is murdered, and Jade is on a mountain with a group of out-of-control actors. Arruda calls her character a "female Dirk Pitt." Each author answered questions about the particular settings they used, and it was a fascinating discussion, emphasizing the author's own family stories that led to these mystery stories. And, what are they writing next? Libby Fischer Hellman has Georgia Three; Cara Black called her book Aimée Twelve. Shilpa said she can't say the title because she likes to keep her working title close to her chest. And, Suzanne Arruda announced Crocodile's Last Embrace. Saturday afternoon was spent with authors of Women's Fiction. But, it was fun to end the morning with hugs from Cara Black and Libby Fischer Hellman. Tomorrow: Saturday afternoon - Women's Fiction at the Tucson Festival of Books. Thanks for your take on what sounds like a great conference. I have one of Black's books on my shelf to read, and I enjoy her blog--Murder is Everywhere. You're welcome, Michele. It was a terrific conference, with something for everyone - children, teens, adults, readers of everything from science fiction and fantasy to nonfiction. There were some nonfiction authors I would have liked to have heard, beginning with Timothy Egan, but just couldn't get to everything. How I wish I lived closer - this sounds like a fabulous event! I LOVE the little girl's question asked of John Scieszka -- "outta the mouths of babes" as the saying goes. Wasn't that a great question, Molly? 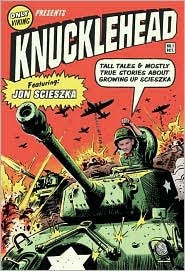 And, since Jon Scieszka made fun of himself through the whole program, you could tell how much he liked it as well. It was a fabulous event! Everyone I was with had a great time, Elizabeth. Terrific conference! Lesa, we WERE at the same presentation!!! Wasn't he hysterical? It was great to laugh and enjoy him as a kickoff for the day!. And to think I even got Professional Development hours for it! I grabbed his book right up and have laughed as I read it to my husband on the way home late that night. I was the person who asked him the question about what graphic novels he recommends for boys in the classroom. He and I had quite a talk after the presentation as well. He was a blast to talk with and I wished we could have laughed and talked some more. Thanks for sharing about a great morning. I did a few more Prof. Dev. classes and then was on to JA Jance, Terry Brooks, Hardened Landscape - Hardened Criminals. What a great day! I heard that question! I was across the room from you in about the second row or so. He was terrific. I did women's fiction in the afternoon, Barbara Samuel O'Neal and Meg Waite Clayton. And, had a really good dinner at Pastiche to end the day! I love Jon Scieszka. Wonderful author. The True Story of the Three Little Pigs and The Stinky Cheese Man were read to my daughter over and over and over. Lovely that you got to hear him. What a fun mystery panel. I'm looking forward to reading all those ladies. I have some of their books, but not all. One day. Wonderful photo and notes on the 4 women authors. The novel set in Bombay really appeals to me. I found the city to be absolutely fascinating when I visited in the 1980s. I doubt that it had changed much from the Bombay of 1960. In fact, 1980s Bombay seemed unchanged from Lewis Bromfield's 1940 novel NIGHT IN BOMBAY. You're welcome, Shilpa. Good luck with your book. It was a fun panel. I enjoyed hearing everyone talk about their books. Thank you, Pat. Your note must have come in while I was answering Shilpa. Very timely. I hope you enjoy the book. Always happy to introduce a reader to a new author.